Let’s start with a quick quiz question. Do you know who Amanda Patterson is? About a month ago I didn’t know her. Like alot of people, I didn’t really know much about the Special Olympics either. Founded by Jackie Onassis in the mid 1960’s, Special Olympics is the world’s largest sporting humanitarian event. 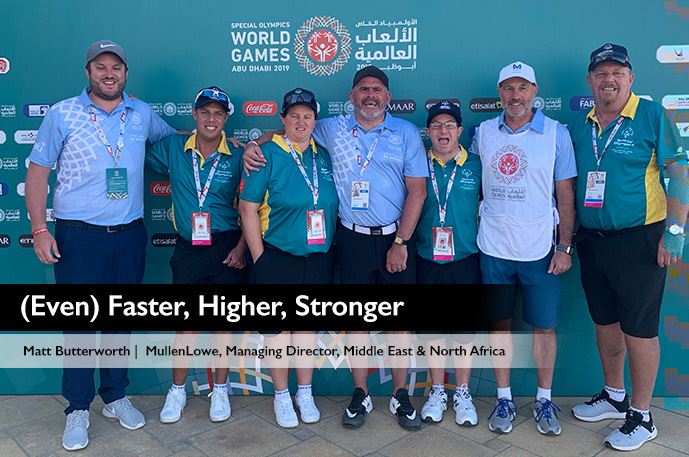 Over 7,000 athletes with intellectual disabilities and physical disabilities drawn from 190 countries, competing across 24 different individual and team sports, in venues across Dubai and Abu Dhabi came together for the 23rd Special Olympics last month. My story started back in 2018 when I led an integrated MCN team tasked with developing the communications strategy for First Abu Dhabi Bank (FAB) #client could position itself and create a legacy around its support and sponsorship of the event. Our first point of call was to get to fully understand the realities that people with learning disabilities face in society. It was fascinating from the outset. Sitting with the Sedra Foundation (Services for Educational Development Research and Awareness for Inclusion) myself and the team got to understand some of the complex day to day issues People of Determination (POD) face and the trials, tribulations and emotions they go through on a daily basis. It got me thinking. What can I do to help? What positive contribution could I make and get to know these wonderfully creative, dynamic and compassionate people? 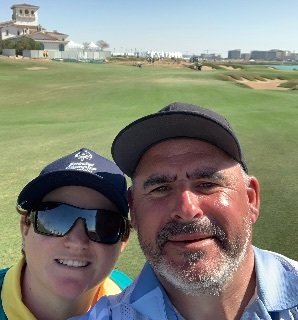 When the organizers of the Special Olympics put out a call for volunteers, I jumped at the chance and was lucky enough to be given the role as caddy for the golfing event at Yas! Links (this was even better as although snowboarding is my sporting fix, there isn’t much snow in the UAE, so I play a lot of golf, my wife would say too much!). I was fortunate enough to caddy for the Australian Golf team of 24-year-old Jason who had Downs Syndrome, Chad, 22, and Amanda, 39, who both had learning difficulties. To the outsider you wouldn’t know they had any sort of difficulties. Like everyone, they all had differing personalities, some were extroverts, some introverted, others were incredibly funny and, charismatic. What was the same for all of them was a warm, positive and happy mindset. However, of course I was a little nervous and unsure about how to act, what to say and the best way of communicating. What I quickly discovered is that the art of communication with a POD is key. Communicating to them on what is a very technical game was a process of trial and error. Golf is tough at the best of times, alignment, discipline, swing speed, hand eye co-ordination are all components that have to be considered. In order to get the right outcome (ball straight and down the fairway), I had to try different methods (actions responses and conversation) to get the desired result. This became a very careful balancing act, whilst I might be doing my best to help and give advice, anything I said could have been taken the wrong way and be seen by the athlete as undermining them, which of course I wanted to avoid at all costs. 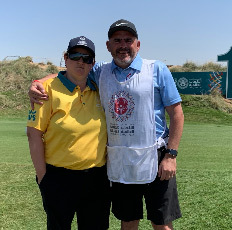 I caddied for Amanda Paterson, she suffers from learning difficulties and yet has travelled the world with her family. She has partaken in 2 olympics, the last one being in Los Angeles. From the onset, we encountered difficulty understanding and accepting the limitations we both created for each other. Everyone has good and bad days (especially on a golf course). Her mood and temperament varied from day-to-day and I couldn’t identify any predictable patterns or identifiable causes. Learning disabilities often are not visible, through patience we had to work through bad shots or frustration together as a team. So rather than say ‘try harder’, I said ‘well done, great shot’. In one instance Amanda hit a 10x, she was inconsolable, the fear of failure had hit and she was embarrassed like any other human being. This was when I needed the test and refine model and I kept going until I found a formula that worked and got her to be positive again. I am not over dramatizing or simplifying to state that other than the birth of my children and the marriage to my wife, this was THE most amazing heartwarming experience of good and kindness that I have ever experienced. Something I will never ever forget. I was surrounded by only positive energy and love that was injected into every human being that attended the event. It was inspirational to see and hear the stories of the athletes, their family and friends, supporters and other volunteers. To see Jason who finished 4th without a medal, jumping and screaming with joy because he emulated his idol Tiger Woods by beating another player on the day was remarkable. The way he celebrated on the podium was simply positivity at a level I have never seen; this is surely what life is about. Has the experience changed me? Well I certainly feel I am a better human being for being part of this wonderful spectacle. If nothing else it reminded me of the benefits of trying new things. I implore each and everyone one of you, step out of your normal comfort zone and try the joy of doing something new for the first time. Search out to people and just do one good thing, make a coffee for your colleague, be spontaneous, go to somewhere you’ve never been to before, start a conversation with a stranger. It might rain, we might lose a client, we may even get angry with each other, but all this isn’t important in the context of the experience I’ve just been part of. As I sit here writing this, I think of Chad, and Jason who’s my personal memories will outlast many of the insignificant encounters I call times to remember. …and to finish where I began, Amanda Patterson is an Olympic Bronze medalist. More importantly Amanda is a reminder that in a world of negativity, oppression and materialism there is also a world where there is a positive spirit in which human kindness, self-belief and positivity lives stronger in those that are far worse off than the average person. To quote the son of Special Olympics founder Eunice Kennedy Shriver in his speech at the closing ceremony at Zayed Sports City Stadium, ‘Be strong. Be ready. Be you and be free’.